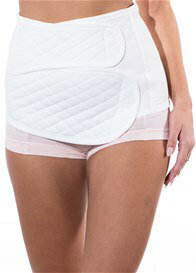 Belly Wraps are a modern adaption of an age old practice to help flatten and firm your tummy after giving birth. At Queen Bee, we're about more than maternity clothing. For over a decade we've been providing post pregnancy fashion to style conscious women around the world. Our range of postpartum fashion wear is specifically chosen to compliment your unique style. After nine months of pregnancy, you probably can't wait to step back into your pre-pregnancy wear. So browse our range of post partum wear and you'll be stepping back into your favourite styles in no time.